* Bit states to represent 32 possible states. The first state is the mask state to reset states. * Those states can be used to define component transition states while animating it. 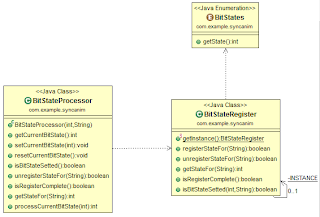 * In combination with a state pattern, you may associate any bit state to a transition, position, animation or whatever you need to monitor in a proper sequence. * and do an "or-operation" on it. You'll be able now to extract all those information (3 states) from just one bit combination without having to explicitly ask for it using a lot of if/else cases. 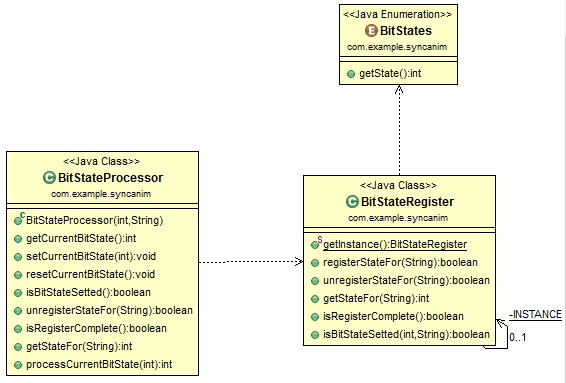 * Use this register to associate bit states to concrete states in a state pattern. * zero state (reset mask state). * State Register. It registers a new state only if not exists already. * This Register is able to register from 1 up to 32 states in a 32 bit system. * To obtain the zero state(reset mask state), call getState("zero"); on it. * To check if the register is already completely full, call isRegisterComplete(); on it. * @param stateClassSimpleName the simple class name provided by calling: ConcreteState.class.getSimpleName(); on your concrete state. * @return true if the new state was created, false if the state already exists or the register is full. * Returns true if the Register is already completely filled up with 32 states , false otherwise. * Checks if the state of the given state class name is set in the current bit state. * @return true if the bit is set, false otherwise. * A bit state processor with a process state capacity of max 32 states. * Favor/consider always the usage of a state pattern instead of it. * But in case the state pattern is inappropriate, you can use it. * Returns a new bit state. * @return the new bit state after an "or-operarion" with its internal state.